Teeth loose minerals daily causing demineralization. Acids, Plaque, and bacteria strip away minerals and can cause cavities. Fluoride, calcium, and phosphate replace minerals which is called remineralization and reduces tooth decay. According to the CDC in Canada: Ontario, Alberta and Manitoba have the highest percentage of community water fluoridation with rates of 75.9%, 74.7% and 69.9% respectively. At the other end of the scale, the lowest rates of water fluoridation can be found in British Columbia (3.7%), Newfoundland and Labrador (1.5%) and Nunavut and the Yukon (0%). So why are these percentages of the population that receive fluoridated water so different? Social influence is probably the main Factor. A lot of people are scared of something they do not understand. There is 65 years of proven studies indicating that fluoridated water is safe and extremely effective in preventing decay through remineralization. Recent studies say there is a 20-40% reduction of tooth decay due to fluoridated water. Not to mention it’s saving the consumer money. For every 1$ invested for fluoridated water, it saves 38$ in dental treatments. How much fluoride is in fluoridated water? Fluoride is added to public water supplies at an average concentration of about 1 part per million (1 ppm) or 1 milligram per liter, or slightly below (0.7). Naturally occurring fluoride concentrations in surface waters depend on location but are generally low and usually do not exceed 0.3 ppm. However, groundwater can contain much higher levels naturally. 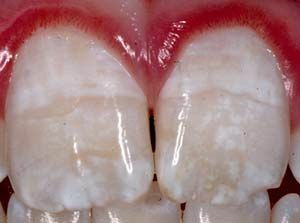 This is what fluorosis looks like – mottled teeth or patchy white spots that stand out when you smile. It is often caused by getting too much fluoride as a child when the adult teeth are still forming. It could be due to a combination of fluoridated toothpastes, water supply, mouthwash, supplements and/or fortified in foods, according to webmd. Some dentists actually prescribe fluoride pills. Some main indications are for people who are more susceptible to decay because of dry mouth, those with crowns, bridges, or braces and between the ages of 6 months to 16 years. However, too much fluoride can cause mottling or pits in teeth, discoloration, or stain enamel. Though, anyone who is prescribed fluoride is carefully monitored by dentist. Even Though, water fluoridation is thought to be dangerous, there is no need to worry the amount present in water and toothpaste. These levels are very low and widely considered beneficial. 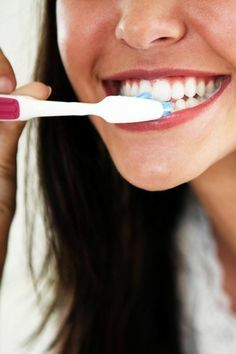 Fluoride however, has been known to be added to some food and drink sources. The percentage of each is at the discretion of the manufacturer and therefore it may be difficult to know how much an individual is consuming. Time and time again fluoride has been proven to be a safe and effective preventative measure to dental decay. Please do your own research to make a fully educated opinion. well written аrticle. I’ll make sure to bookmark it and return to reɑd more of your useful info. Thanks for the ρost. I will definitely return. Gгeat post. Keep posting such kind of information on your blog.